Family and friends are aware that one of my favorite hobbies is reading. I spent so many sleepless nights poring over various books I find really interesting. It could be science fiction, fantasy, romance (yes! ), documentary, biography, self-help or inspirational. As long as it is interesting and well-written, no page is left unturned. So that explains my excitement when I got an email from Katherine telling me about this book titled Becoming Princess Charming. Becoming Princess Charming is not a fairytale of any other girl - it’s about you and me and every other girl in this big wide world. Apart from being entertaining, the book aims to empower every woman to become the best person they can be, someone who exudes self-confidence, grace and optimism. To give you an insight what this book is all about, here’s the guest post from the book author herself, Morgan McKean. Have you ever found yourself in a really happy place, I mean the kind of space where you felt on top of the world and that anything was possible... or, felt so sad and low that all you could see was dark skies ahead? While our emotions can take us through an up-and-down roller coaster of feelings on any given day, the one thing that’s consistent, is that we always have them. So, if emotions and or feelings are a part of who we are, at least to some degree, you would think that we would automatically know what they’re for, and how to work them. However, if you’re like many of people I know and work with, while you probably have some idea of their purpose.... on the whole, not really. So, what are emotions, and why do we even have them? Whether guiding us towards making simple day-to-day choices or influencing us on which path we take in life, our thoughts have a direct effect on how we create and experience our physical reality. For example, if you wanted to become an interior designer, then it’s not likely that you would engage in thoughts and ideas that would lead you towards accounting school, but rather, you would be focused on those thoughts, ideas, and opportunities, like taking art classes, that would support you in your ability to become an interior designer. The reason it’s important for you to first understand how your thoughts effect your life experience is because it is your thoughts that influence your emotions, or how you feel. You see, similar to a compass that lets us know when we are, or are not, on course with our desired destination, our feelings serve as an internal feedback system letting us know whether or not the thoughts we’re thinking are leading us in the direction of our desired experiences. When we feel off-balanced, stressed, overwhelmed, or anxious, that’s our emotional compass letting us know that the thoughts we are thinking are not on course with the reality we want to experience. Accordingly, when we do feel happy, joyful, contentment, or bliss, this is our compass letting us know that the thoughts we’re thinking are on track with our desired reality, and that we should continue along this particular thought stream. While it’s tempting for us to only want to experience feelings love, success, and happiness, because they make us feel good, every emotion or feeling that we experience is meant to let us know the direction that our thoughts are leading us in. When the thoughts we think are on track with our desires, our emotional compass provides us with an array of positive feelings, which helps support our belief that we can create our life the way we want it to be. However, when our thoughts are leading us towards an experience we don’t want, we will receive a plethora of negative feelings that make us feel afraid or unworthy of manifesting our dreams. Therefore, whenever we feel anything less than happiness, that’s our cue to check into our thought stream to see what kind of ideas we’re entertaining. When we do this, we are better able to identify limiting ideas and beliefs that we need to release, so that we can refocus our thoughts and ideas on creating our life the way we want it to be. Feeling less than happiness while creating your current experiences? • Remind yourself that you are the author of your story, and you have the power to create it the way you want it to be. May your happily ever after be as fabulous as your dreams! There you have it friends! 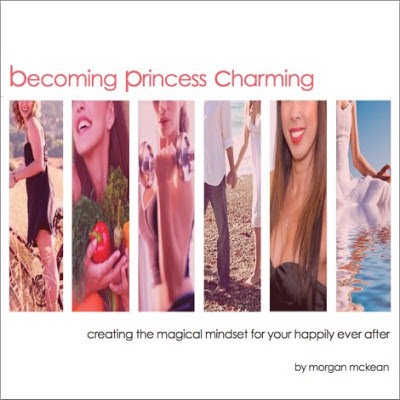 This article is based on the new book Becoming Princess Charming © 2013 by Morgan McKean, and is being published with her permission.